Michael McCreadie, with 2010 Parlympian team mates Aileen Nielson, Tom Killin and Angie Malone lifted the Caithness Cup at this weekend's British Open, defeating the all-male team of Jim Taylor, Bill Masterton, Jim Elliott and Ian Donaldson 5-3. The McCreadie team fought off opponents seeking to avenge a 17-1 round robin drubbing in what GB coach described as a high class final. "They had to pull out all the stops and manufacture some excellent shots right from the first end where they developed a two with the hammer after being under pressure from the off. From there they tried to keep the game tidy and force the Taylor team away from their aggressive style of play." McCreadie stole three consecutive ends to go 5-0 ahead after 4 and held on for the win despite giving up a steal of two in the 6th and final end. 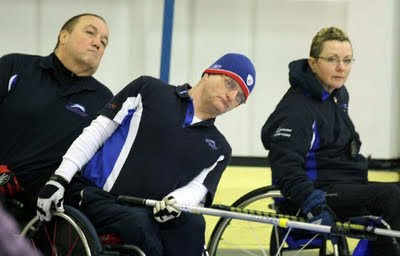 Eight teams contested the championship including Great Britain II with 2010 Alternate Jim Sellar, and skip Rosemary Lenton, the last person cut from the 2010 squad. Complete scores are available HERE.